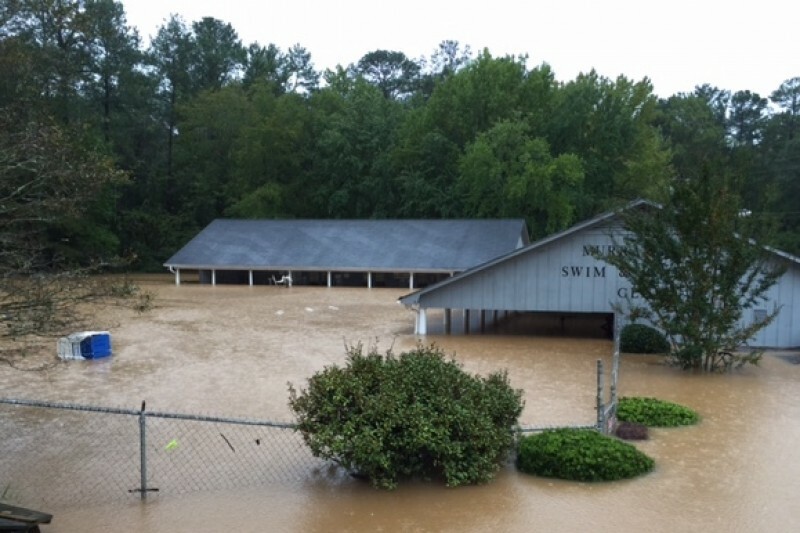 Neighborhood Facility at Murraywood Ruined by Flood. On Sunday, October 4th, we awoke to find that flood waters had inundated our tennis courts, club house and swim facility with water 6 feet deep. When the water receded, it left behind nearly a foot of mud covering the devastated buildings and courts. Volunteers (parents and junior tennis players) were able to salvage some furniture but everything else must be replaced; flooring, walls, cabinets, and appliances. Prior to the flood, being at Murraywood was an uplifting experience. On a daily basis, over 50 kids ranging in ages from 8-16 participated in the Junior Tennis Program. Irmo High School swimmers used the pool as a practice facility - what a joy to see all those kids having good, clean fun! On weekends, you would see see volunteers helping out with the Special Olympics kids who were practicing for their events. Murraywood also does fundraisers for Sistercare, local school donations, and youth programs like the Girl Scouts. We need help to restore our facility and continue these programs. Restoration involves new electrical systems, new pool pump and wiring, rebuilding and resurfacing tennis courts, replacing floors, walls and kitchen in the clubhouse, and so much more. So many of you have asked “how”? Please consider a cash donation. Thank you all for your thoughts, prayers and concerns. Your financial help – no matter how large or small – is greatly appreciated. Good News! We have received $4740 in direct donations to the club. Thank you everyone who contributed.